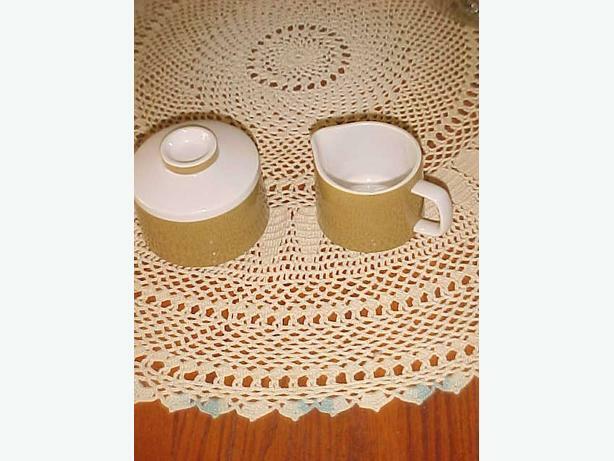 THIS VINTAGE CREAMER AND SUGAR WITH LID WAS MADE IN JAPAN BY MIKASA. THE PATTERN IS MEDITERRANIA. THE COLOR IS AVOCADO. THE CREAMER STANDS 2 ¾ INCHES TALL AND THE SUGAR BOWL 3 ½ INCHES TO THE TOP OF THE LID. ALL THREE PIECES ARE IN EXCELLENT CONDITION WITH NO CHIPS OR CRACKS.